Elected officials, community leaders and citizens came out Monday afternoon to celebrate Brunswick County’s newest senior center, the Brunswick Center at Leland, with a ribbon cutting ceremony and facility tours. 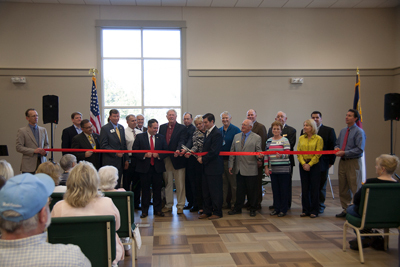 A ribbon cutting was held at the new Brunswick Center at Leland Monday afternoon. The new, two-story center is approximately triple the size of the older, smaller building it replaces, with more room for classes and activities for seniors, as well as space that can be rented by the community. Built on land provided by the Town of Leland, the new center is near the Leland Library, Leland Town Hall, Leland Municipal Park, and Leland Police Department. The Brunswick Center at Leland is another step forward to having a senior center in each county district, said Brunswick Senior Resources, Inc. President and CEO Jim Fish. It joins similar facilities in Southport and Shallotte, with a fourth soon to open in Supply. There are also seven senior sites throughout the county. The new center will also be able to more than double the number of lunch meals offered per day, with the ability for meals to be prepared on site, and it will serve as a pick up location for Meals on Wheels drivers.